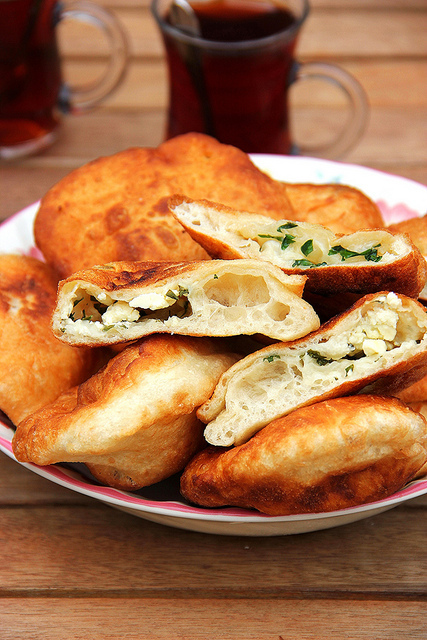 Pişi is a very simple Turkish, bread-like, fried dough snack. People in Turkey usually eat this for breakfast, but please, dont let that stop you from eating it whenever you want. =) Until recently, I had no idea that the official name of this dish was called Pişi. My mother and the rest of my family call it simply fried dough (hamur kizartmasi). But pişi sounds more fun, so pişi it is! Sift together flour and salt into a bowl. Make a well in the center and add the yeast, sugar and half cup of water, mix well and set aside till frothy. Mix well, add one fourth cup of water and knead into a soft dough. Cover with a damp muslin cloth and set aside for two hours. Heat one tablespoon oil in a non-stick pan. Add garlic and onion, mix and sauté for two minutes. Add spinach, mix well and for a minute. Add cheese and mix well. Set aside. Divide the dough into eight equal portions. Roll out each portion into a sheet, place a portion of the stuffing on one half and fold the other half over the stuffing. Seal the edges with a fork. Heat sufficient oil in a kadai. Deep-fry the prepared pisis till golden and crisp. Drain on absorbent paper.